The first day of summer will arrive at today, bringing with it the longest day of the year. 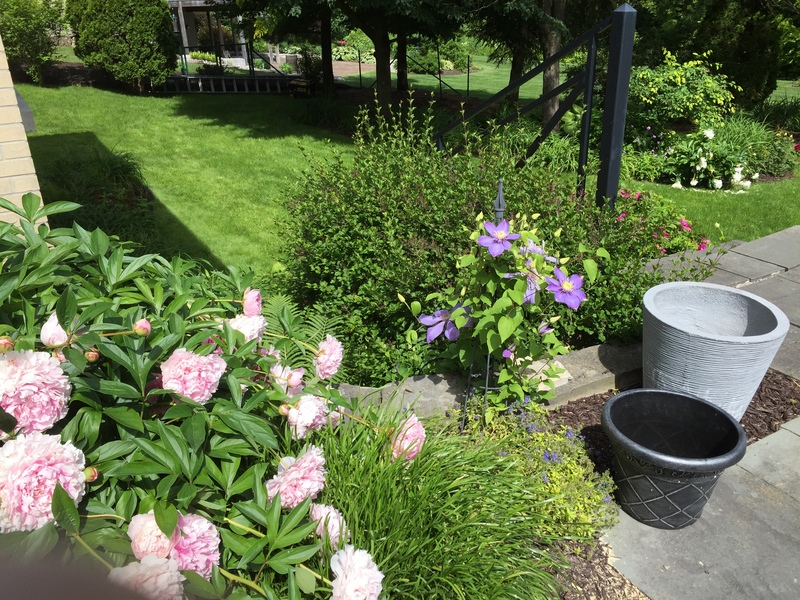 So far, the garden is happy although a little confused with roses—outstanding for the first time in years—blooming with the peonies. My favourite blue clematis, struggling up from the depths of fern garden, climbs over the rock wall and up a support. I’m a bit behind in planting. My terrace pots, most of them, are still empty. If the rain holds off, maybe I’ll get to them today. Good news from a contest in the UK: a piece of flash fiction that I have worked on from time to time for years, The Gulls Soared, placed third in the Winchester Writers’ Festival. The prize is a selection of books, but I don’t know which ones as yet. Contests are a terrific way to get your name out, earn a little(sometimes) and receive feedback on your work. Aerogramme Writers Studio lists contests by closing date every two months. June 6 and 7 I spent at Barbara Kyle’s workshop “The First Thirty Pages”. A terrific two days, sharing writing with only 8 others plus Barbara, allowing an in depth look at everyone’s work. A one on one with Barbara was the highlight for me although her advice has me working diligently on an outline for my all ready completed novel. That process is ongoing and should help me sharpen the focus. Check out Barbara’s website for news of a terrific Writer’s Symposium she’s organizing for the fall. A tip for writers: A cheat sheet for writing body language can be found at Body Language, written by blogger Amanda Patterson. That’s about it for this Sunday morning in June. I’m back to my outline.